A handy Windows utility that converts PDF documents to High Quality JPG, BMP, PNG, TIF and GIF image formats. PDF To JPG Converter is a windows utility that quickly converts PDF Files into high quality JPG,BMP,TIF,GIF,PNG Images. With PDF To JPG Converter users can also convert PDF to JPG in page range, and set the output image DPI. Download it Now! Compatible with all Popular Windows Platforms! PDF To JPG - 60 to 900 DPI! 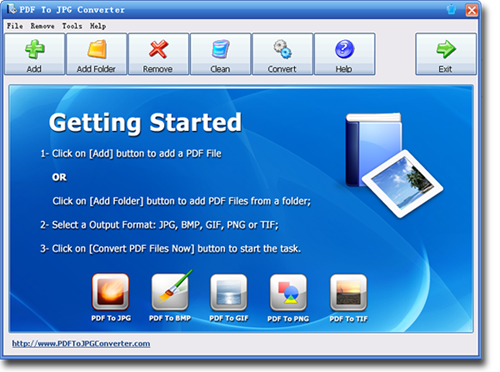 PDF To JPG Converter is very easy to use, fast and has a very nice user interface. With PDF To JPG Converter I can convert my work PDF to JPG and TIF in 3 clicks. Also PDF To JPG Converter helps me to convert PDF to PNG for my website. I love it! Very useful program, especially for PDF to JPG Conversion. It's much easier to convert pdf to image formats. What's perfection! PDF to JPG Converter Now Supports all Languages PDF Files and OS! PDF To JPG Converter allows users to convert PDF to JPG images, so that users will be able to use the PDF information on website, or read the content without PDF readers. By modifying the DPI setting to a high number, PDF To JPG Converter will export large and high quality images from PDF. Users can use the exported high quality images for printing or publishing ads. Users can add hundreds of PDF documents from a folder, or drag them and drop to the file list. PDF To JPG Converter will convert PDFs to images in separate folders. PDF To JPG Converter has a fast conversion engine which will convert PDF docs 180% faster than other normal PDF converters. Saving time is saving money. Converting PDF to JPG is not the only function of PDF To JPG Converter. The program also supports to convert PDF to TIF, PNG, GIF and BMP formats. Users have more options for the final converted image format with this converter. Finding a reliable application to convert PDF files to JPG isn't an easy task for PDF users. There are countless products on the market. Some of these programs run slow, may not be trustworthy, and others are very expensive. Indeed, it difficult to find reliable, high-performance PDF to JPG conversion software at a low cost. If you opt to try the available options one by one, you will get dizzy. Besides, the trial process for each program is, and you may end up installing malware in your device. To save your time and perform your tasks efficiently, you may want to try PDF to JPG Converter. It's a highly efficient program that is available for both Windows and Mac. It performs excellently when it comes to converting both large and small PDF file sizes. Here are the features and benefits of using the PDF to JPG Converter. Who doesn't like working with high-quality images? Finding a happy medium between image quality and file size is an important consideration for anyone trying to convert a PDF file to a JPG file. The right JPG quality ensures your pictures look great. If you intend to upload the converted images onto your website, a perfect balance between the file size and quality improves your site's page loading speed. Image quality depends on a variety of factors s including the contrast of the pictures, color, the file detail, and the specific level of user experience you intend to achieve. Keep in mind that some pictures can be compressed further without loss of quality, but some JPG files start to show a significant quality reduction much sooner. If you intend to convert a PDF file into a JPG file, you don't have to worry about the quality of the converted file. PDF to JPG Converter allows you to specify the quality level of the output JPG file. If the PDF file contained written information (not pictures), the resultant JPG file would be clear enough for the target audience to get the right information from the image. You can modify the DPI to a high number to get high-quality images. This option also allows you to increase the image size or reduce it without compromising the quality of your images. Quite often, computer users wonder why some PDF files are so big while they are just a few pages long. The same question arises when you split a PDF file into multiple files and discover that the resulting files aren't proportional to the number of pages. That means if you intend to convert a large PDF file into JPG file, splitting the file might not reduce its size proportionally. Besides, splitting the file might interfere with your desired JPG file. Fortunately, the PDF to JPG Converter allows users to convert large PDF files into high-quality JPG files faster than most PDF conversion programs. Also known as option content, layers (in the context of PDF files) refers to various sections in a PDF document that can be viewed selectively or hidden by document readers or authors. This feature is useful in items such as maps, multi-language files, layered artwork, and CAD drawings. PDF to JPG Converter is a highly sophisticated program that lets you convert layered PDF files into perfect JPG files seamlessly. Regardless of the size or the application used in the creation of the PDF file, you can rest assured of getting top-quality images from the converted PDF file. Download PDF To JPG Converter!